Minuteman maple leaf andirons are black powder coated. Crafted from durable wrought iron, these gorgeous fireplace additions add elegance to any room in addition to their function of holding wood up off the brick to allow for air circulation beneath the flames. Position them closely together for short pieces of wood or further apart for longer lengths. These fit virtually any fireplace. 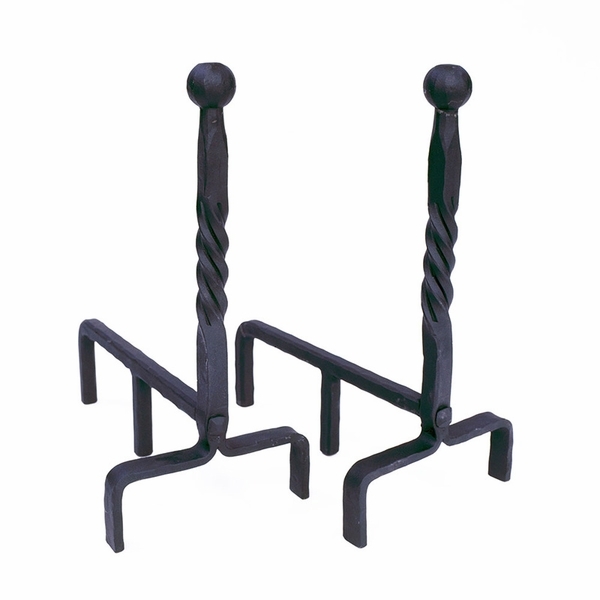 Each andiron measures nine inches wide, 18 3/4 inches high, and 14 3/4 inches deep. A matching pair makes a thoughtful gift as a house warming present; buy them for yourself as a beautiful accessory to blend with any decor. These andirons really improved the appearance of our kitchen fireplace. They look really nice and do a job as well. I think they will last for quite some time.